Jenna Samuels and her guardian angel brother battle heavenly head-honchos and earthbound bullies in this hilarious, Texas-set follow up to The Sweet Dead Life. It's been almost a year since Jenna Samuel's stoner brother, Casey, bit the dust and returned as her guardian angel. A year since Casey and his "angel boss," Amber Velasco, saved Jenna's life and helped her foil the bad guys--more or less. A year in which Jenna has solved the true mystery of the universe: how to get one Ryan Sloboda to ask her out. Jenna's feeling mighty cheery about life and love. But Casey, whose doomed relationship with Lanie Phelps (who has no idea her boyfriend is, well, dead) isn't doing much to distract him, has his own big question: Why is he still hanging around? Bo Shivers, a heavenly head honcho Jenna and Casey didn't even know existed, might have the answer. Bo knows something big is coming. Something that might just change everything for Jenna Samuels, who once again finds herself up to her non-winged shoulders in heavenly secrets of global proportions--just as she's finally found the perfect Homecoming Dance dress. Joy Preble lives in Houston with her family, including a sweet but slightly unhinged basset mix. She teaches and lectures widely on writing and literacy, and is the author of the Dreaming Anastasia series and Finding Paris, which SLJ called "An intricate guessing game." 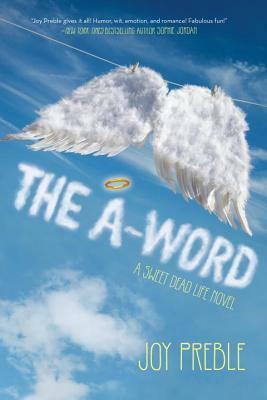 The A-Word is the sequel to The Sweet Dead Life, which Kirkus hailed with "Hallelujah!" Like its narrator Jenna, Joy likes cowboy boots, breakfast tacos, and crazy unexpected stuff. Visit her online at joypreble.com or follow her on Twitter @joypreble. "Joy Preble gives it all! Humor, wit, emotion, and romance! Fabulous fun!" "A smart, sassy, supernatural mystery chock-full of heart, hope and fun." "The Sweet Dead Life is mischief and mayhem, zippy one-liners, mystery and a tiny bit of tragedy. A-word: Awesome." "There's a whole lot going on here: poisonings, blackmail, sibling relationships, romance, and abandonment, in addition to angels, but the unifying thread is Jenna's clever, bitter, self-aware, and loving voice ... Preble's lively descriptions and unusually well-drawn, caring sibling relationship (a topic not usually explored in teen fiction) are especially noteworthy." "Bizarre? Yes, very. Fun to read? Yes, very." "Hallelujah! A paranormal tale of angels that's not a romance, making it a novel that breaks the mold."